Yesterday I updated my look at temporary jobs, a known leading indicator for jobs overall. Today I want to look at two more leading sectors: manufacturing and construction. Unlike temporary jobs, I’m not looking for a possible decline. Rather, I am looking for a deceleration in growth from their recent peaks. Let’s take them in order. The important point of the two is that manufacturing jobs tend to follow the ISM index with a 6 to 12-month lag. Thus, for example, the ISM manufacturing index first went into contraction (a reading below 50) in October 2015. Manufacturing jobs didn’t contract YoY until March 2016. By June 2016 the ISM index had turned positive again. Manufacturing jobs didn’t get there YoY until February 2017. 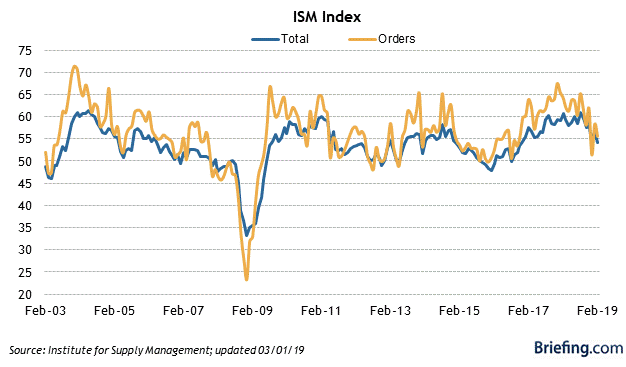 In 2018, the ISM manufacturing index peaked in August. So I am expecting YoY growth in manufacturing jobs to decline. Since one year ago manufacturing added 30,000 jobs in February, I am expecting substantially fewer than that to be added tomorrow. Although the former is somewhat noisy, it is pretty easy to see that usually construction jobs have followed spending by a few months — except in the last couple of years, and arguably during the first couple of years (2006-07) of the housing bust. Now we can see that the two grow or decline at nearly identical rates over the longer term, with jobs following spending with a short lag.